Refunds will be issued to the original purchaser within 7-10 business days. Note that if you purchased tickets that were transferred to you, the original refund will go to the original purchase. You will have to seek a refund from the person you bought the tickets from. No word yet on whether camping will also be refunded. All of the social media accounts for the festival have been deleted or suspended, along with the official website. This doesn’t bode well for the future of this event, and if they were truly planning on rescheduling, then why suspend the website and social media channels? Rumors are that Lil Uzi’s attempting to get out of his record label contract by skipping concerts and saying that he is “retiring”. However, losing one headliner shouldn’t end an event which was primarily featuring Bassnectar. Bassnectar does not appear to have issued any public statements regarding the cancellation, but it is important to remember that Live Nation was producing this event. One of the reasons that Sasquatch failed was due to its takeover by Live Nation: after Live Nation took over, the cost of attending Sasquatch almost doubled, while the selection and quality of artists booked deteriorated. This led to decreased attendance which eventually led to its downfall. Did Live Nation think that they could book a few big name artists to get as much $ out of attendees as possible? Without much official promo, such as professional marketing videos or staff, it’s hard to see otherwise. Either way, this is a disappointing development for the PNW music scene. Any additional information that comes to light will will be added to this post. For questions, contact [email protected] or bassnectar.net/contact. Questions should be directed to the promoters and festival team, as it’s their event. They will be refunding all tickets and shuttle purchases. 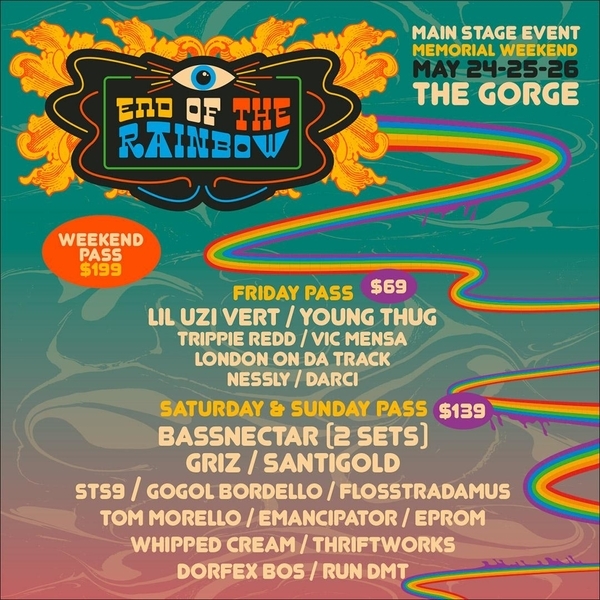 Bassnectar has released the lineup for the inaugural End Of The Rainbow event at the Gorge! Produced by Live Nation, EOTR will feature three nights of music (similar to Sasquatch) on Memorial Day Weekend, May 24th, 25th & 26th. The lineup is a mix of mostly bass and hip-hop, but includes a variety of acts evolving from the indie rock roots of Sasquatch to today’s hip-hop influences. Ticket update: $69 Friday tickets and $139 Saturday & Sunday tickets are now available! *It has historically been cheaper to bring cash and purchase camping at the campground entrance than to purchase camping online. 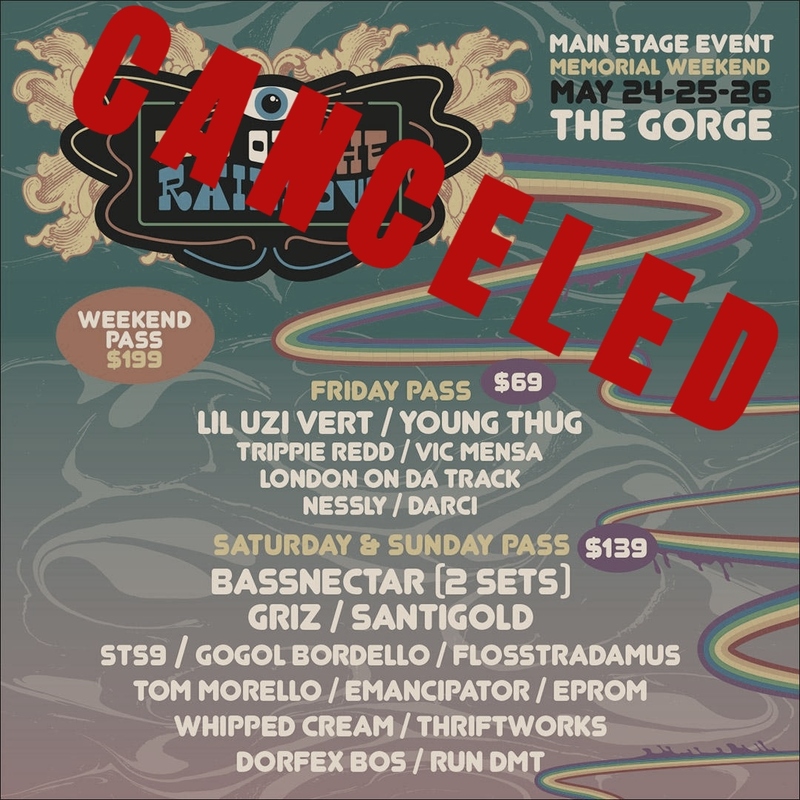 It is not possible for the Gorge to sell out of camping spots.